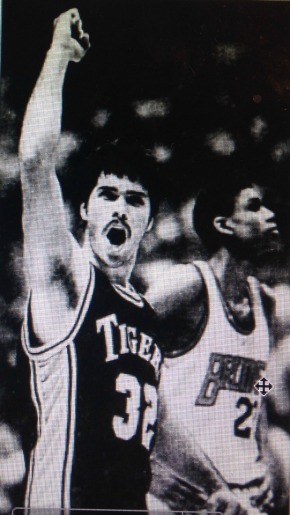 Richie Farmer clearly recalls how his record-setting Sweet Sixteen career began in Rupp Arena 33 years ago this week. Clay County had a big lead on Owensboro in their first-round game when Farmer, an eighth-grader, took the floor with 1:08 remaining. Then, with the clock ticking away, “I got the ball in the middle of the floor against their press, coming down on the break, and I hit a little 12-footer in the lane (with :05 left),” Farmer said last week. Farmer, however, doesn’t remember the final shot of his Sweet Sixteen career. It came in a losing effort against Ballard in the 1988 finals in Freedom Hall. He hit a straight-away 22-foot three-pointer with 14 seconds left to cap a championship-game record 51-point performance. Farmer had four threes in the last 1:32, but he has no memory of his final flurry. Richie Farmer played in five consecutive state tournaments – the first player to do so – and scored a record 317 points. He also holds the Sweet Sixteen record for career field goals (127), and shares the record for most three-pointers (9) in a game. But his proudest achievement was helping Bobby Keith’s Tigers win the 1987 state title. They clipped Ballard in overtime in the finals. That championship was bookended by state runner-up finishes to Hopkinsville in 1985 and Ballard in 1988. Clay County made a quick exit from the state tournament in ’86, falling to Pulaski County 83-78 in the first round. The Maroons, led by Reggie Hanson and Shannon Fraley, went on to win the championship. Then came 1987 and Clay County reached the summit. The Tigers beat Ballard 76-73 in overtime in the finals. Farmer had 27 points, 6 rebounds and 4 assists. “Coach Keith always talked about pride, and how we were representing Clay County, the city of Manchester, and Eastern Kentucky as a whole,” Farmer said. “The year we won it we kinda felt we represented all the mountain schools. Clay County had a rematch with Ballard in the 1988 finals, but the Tigers were a tired bunch by the time they got to the title game. They had played LaRue County in Friday night’s quarterfinals, then had to outlast Pleasure Ridge Park 92-90 in Saturday afternoon’s semifinals. Nevertheless, Farmer went out and put on a performance for the ages. Despite being double- and triple-teamed at times, he hit 20 of 32 shots, including 9 of 14 threes. He finished with 51 points, 7 rebounds and 6 assists, but Ballard prevailed 88-79. Farmer was named Sweet Sixteen MVP for the second year in a row, but it wasn’t much consolation. Farmer’s cumulative state tournament numbers are staggering. He played 14 games (11 of them victories), made 127 of 264 field goals (15 of 25 threes), 48 of 69 free throws, and had 64 rebounds and 41 assists. But when Farmer looks back on his high school days, he doesn’t think about the statistics or the victories. “It was about the camaraderie with the people you played with and competed against, and the friendships you developed,” he said. “I’m still friends and close to a lot of the guys I played with and against, like Allan Houston and Scotty Davenport.